Our Drop-In Drama meets every Thursday from 6-8pm at 61 Munster Road, SW6 5RE. This is an informal group for people who are in recovery from or have been affected by addiction. 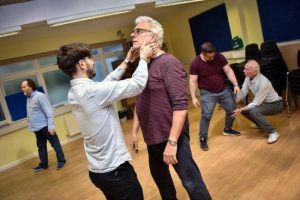 The workshop is a safe introduction to drama and to Outside Edge, suitable for those who may have little or no experience of drama and or in early stages of their recovery. You can just drop-in as part of your recovery process, but we do request that you have abstained that day to take part.